I had been a stay at home mom for almost 10 years and had 3 beautiful children when I went through a divorce. I didn't have a career and the jobs I found just didn't pay our bills. I was so discouraged! My sister kept telling me to go back to school but I just didn't see how I could go to school, work, and care for my children. One day I heard an advertisement on the radio for Pima Medical Institute and I thought ... maybe I can do it. I found the people at PMI to be so helpful and understanding. I knew it would be a difficult 9 months and I'd be putting in 20 hour days 3-4 times a week, but I also knew if I sacrificed now, it would mean a better future for my kids. So, I started the Medical Assistant program. It was tough and I was often exhausted. But I kept reminding myself and my kids why we were doing this. One day in the car my son held up my stethoscope and said, "Mom, you did this for us!" It was one of the best moments! I'm so grateful for all the people at PMI - they were like family to me. Now I have a career in the medical field and a fantastic job with so much potential. Most of all I can provide for my children and they are SO proud of me! THANK YOU PMI! I became interested in physical therapy after my daughter experienced gymnastics injuries. I decided I needed a career change and started looking for schools. 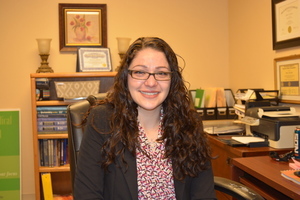 I chose PMI because I heard they had a solid program and would assist with job placement after graduation. My major obstacle was time management. I had 3 children at home and was finishing my Master's degree in business at the same time. Open lab and staying after class cemented my bond with classmates and gave me dedicated time to concentrate on PTA studies. I appreciated the knowledge of the PTA instructors--they were all so helpful including making sure we had the hands-on patient skills and solid test-taking skills to be successful for our board exams. I knew I wanted my first job to be acute inpatient care, but I didn't want to start working until I'd passed my board exam. However, I saw a job posting for UNMH so I applied three weeks before graduation. I got the job contingent upon passing my boards! 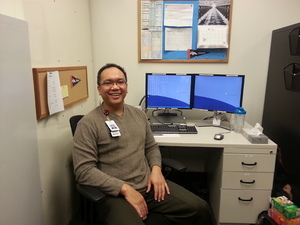 I have been working full time at the hospital and am now teaching in the online BSPTA program for PMI. Thank you, PMI, for the real life preparation you gave me. I have frequently heard, "Wow, I can't believe you're a recent grad!" After working for a number of years, I was laid off. When the company offered to help pay for more education, I decided to look into Pima Medical Institute. The pharmacy technician program caught my eye right away and my friend, John, and I signed up together. We never missed a day of school and we encouraged and competed with each other. Our instructors really pushed us. I studied every night for hours to learn the math. I had the best training at PMI and I want to thank my instructors. Mr. Price, set the tone in my career prep class and I'll never forget him saying, "I know you have potential!" Miss Aldridge made sure I was prepared for the national exam. They were special to me and I'm grateful for their help and patience. It was difficult going back to school as an older adult and I wasn't sure I could do it. But, I'm proud to say - I did it and it's been one of my greatest accomplishments! 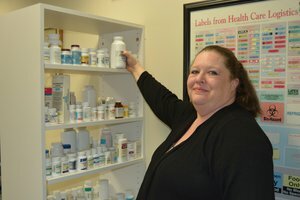 I'm currently employed as a pharmacy technician and I found a career I'm good at! Formerly, I worked as a quality manager in manufacturing but realized that the job was neither rewarding nor fulfilling. So, I began volunteering at a local hospital as a transporter, which is how I discovered the world of medical imaging. I chose Pima because I could start immediately. My experience as a student was tough! As a student you have to make a lot of adjustments and sometimes you have to lose in order to gain. My instructors were hard on me, but I know now that I am a much better technologist because of it. After graduation I applied everywhere and contacted everyone I knew in the business. I was hired at Boulder Hospital. Almost a year later I was hired at Littleton Hospital where I've been expanding my experience. My future goal is to move into management. I recently completed PMI's Bachelor of Science in Radiologic Sciences. It's been a good experience. I thought I might feel isolated learning online and on my own, but I found I was always in contact with my instructors. A big piece of online learning is time management. If I can do it, others definitely can. PMI has provided me a great education and it's given me an opportunity for further advancement. My belief is that the combination of education and advancement leads you to a better place. My birth happened earlier than expected and, as a result, I spent time on a ventilator and have had lung problems all my life. Because of all the time spent around the healthcare profession, I decided to make it my career. I was looking into another four year respiratory program, but realized that although PMI might cost more upfront, I'd make more money by getting a job in just two years. 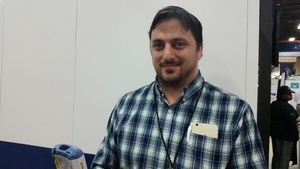 To me, it was certainly worth it, so I signed up for PMI's Respiratory Therapy program. I had a great experience as a student. My instructor's cared about the student's needs and took the extra time to help us and get to know us on a personal level. After graduation, I knew I wanted to advance my career and after some research, I realized PMI's online bachelor program was, again, the best option for me. It was a perfect fit and was an easy transition from my associate's to my bachelor's program. Currently, I am working as an instructor at PMI. I work at a hospital part-time and I'm able to take my experiences and help give my student's the practical understanding they need. I'm planning to continue my education and hope to pursue a master's degree and possibly move into management in the future. Pima has been a very positive experience for me and has created limitless opportunities. Before coming to Pima Medical Institute, I was employed by Toyota and worked on cars for a living. I had always had the desire to help people, but I wasn't sure how to move in that direction. One day, I saw a commercial for Pima Medical Institute and decided it might be a good place for me to start. I was apprehensive at first and wondered if I would be able to be successful in school, but I had a great experience at PMI and everything went very smoothly. Whenever I needed anything from the instructors, they were there for me. Even now, I am still in contact with my former instructors and I know I can call them whenever I need their help. When it came time for my externship, I had a great experience at Children's Hospital. In fact, upon completion of my program, I was offered a position as a Medical Assistant. I've never had a job that I liked before, and now I love my job! 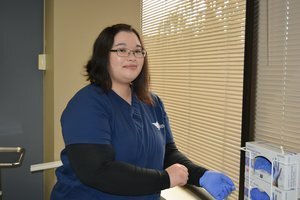 Working as a Medical Assistant has helped me realize I want to become a nurse. I am currently working on my prerequisites and plan to start a nursing program this fall. PMI gave me my start and the confidence I needed, and now I can do more! Thanks, PMI! 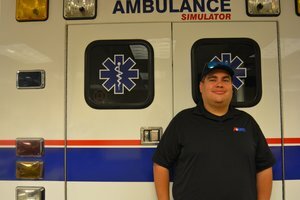 I was an EMT for 10 years in Pinal County, but I always wanted to become a Paramedic. I was waiting for the right time and the right program. I found out about Pima Medical Institute's Paramedic program through my work. We have a partnership with PMI, so their classes fit with our shift schedules and allow us to work full-time and go to school. It's a grueling schedule, but it's doable. Typically, I would work a 24-hour work shift, then go directly to an 8-hour class, and then repeat that process. The instructors were fantastic! They have experience in the field and offer a wealth of information. I was able to meet and become friends with some great people in my classes. The program was challenging but, honestly, the most difficult piece for me was time management. Making time for class and my clinical hours on top of being a father to three children and my job, where I'm also an instructor, was the toughest part. The company I currently work for has a spot for me as soon as I pass my boards. In fact, they are chomping at the bit to move me from an EMT to a Paramedic, which happens to come with a significant pay raise. 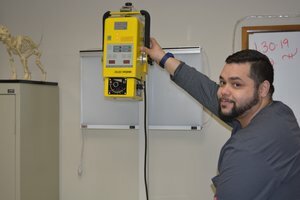 PMI has a great Paramedic program, and I would certainly recommend it to others, especially other seasoned EMTs like me. I was a single mom, working two care giver jobs, and attempting to take classes at a local college, but it was difficult. I wanted to be a good role model for my kids, so I began looking online for schools and programs in the medical field that had a flexible schedule. I found the Pima Medial Institute East Valley Campus and enrolled in their 3 month long Phlebotomy Technician Program and that's when I got hooked! After finishing that program, I continued to work in home health and signed up for the Medical Assistant program at PMI's new Phoenix Campus. It was much closer to my home and more convenient for my schedule of going to school, working, and caring for my kids. I had the best experience at both PMI campuses. I found that every instructor I had put forth so much effort, it made it easy to succeed. It's a lot of work and it is fast paced, but the instructors are wonderful and the sense you get is that everyone is in your corner. After completing the MA program I continued working for the same employer but I was promoted to administrator. I've recently accepted a teaching position at Pima Medical Institute. I am so excited to work on a daily basis with the very instructors I have always admired. I think having been a student, sitting in those same chairs, will enable me to be understanding of my students and their situations. I know the struggles of being a single parent and living on a tight budget while trying to complete an education. I am thrilled and honored to work for Pima Medical Institute. It feels like I'm home! I attended a community college for several years, but I was indecisive and unmotivated. I kept trying different classes and programs but I just didn't have any direction. I had a friend who attended Pima Medical Institute, so I looked online and checked out their programs. 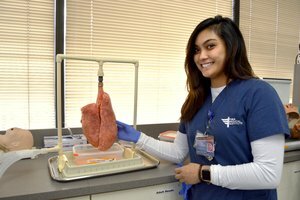 I really wanted to attend the Respiratory Therapy program but I just wasn't ready for a two year program, so I enrolled in the nine month Pharmacy Technician program. I was a little intimidated at first as the program is accelerated, but it got easier as I learned to manage my time. 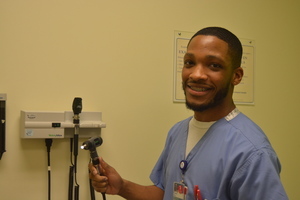 I was motivated to get into the field and had an excellent externship experience. 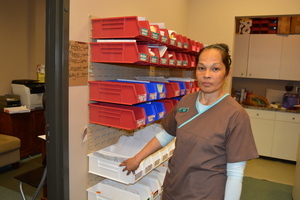 There is a real need for Pharmacy Technicians so finding a job was easy. I'm currently working at a CVS Pharmacy and I'm also back at PMI pursuing my goal of getting my associate's degree in Respiratory Therapy. The instructors are wonderful! 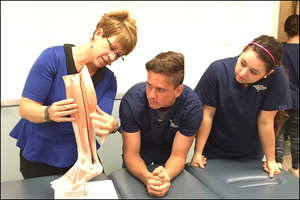 They bring practical experience to the classroom and my clinical experiences help me apply what I'm learning in the program. I am looking forward to my new career, but I don't plan to stop learning. Within a year I hope to start PMI's online Bachelor of Science in Respiratory Therapy program. My education at PMI has been a challenge, but I'm meeting my goals and it is worth it!